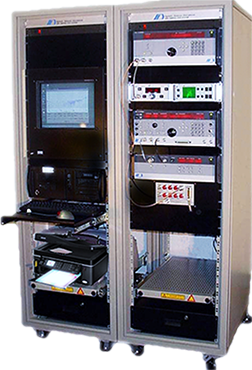 DSII is a dynamic and innovative company specializing in the design and manufacture of sophisticated automated test and measurement systems. DSII's test and measurement systems are used by leading companies, governments and defense industries, to provide data security for classified and other secured data processing, computer and computer networks, modems, facsimile machines, etc. The products are suitable for testing wire and wireless data communication and processing systems, operating at frequencies of current high speed computers and microwave communication, such as K&X Band. 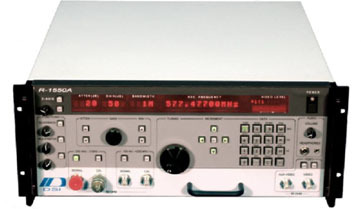 The DSI 600 EMI Test Measurement Receiver System is a step into the future of fully compliant test capabilities integrated into a powerful receiver technology coupled with the computational strength of the on board computer which facilitates high speed data acquisition, an enhanced spectral display module, and SCPI interoperability interface all complemented by DSII’s EMIT software. IF/RF spectrum analysis & time domain capabilities provide an all-in-one multi-functional resource rapidly and accurately providing consolidated concise test results and reports. Low Weight and Small Size for Portability: 42 lbs., 5.25" x 17" x 22", 1.1 cu. ft. 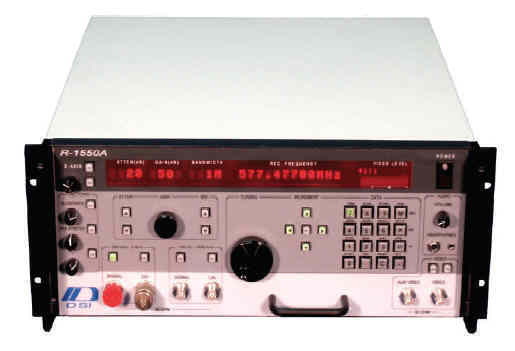 The DSI-1550A operates from 100 Hz to 1 GHz (up to 40 GHz using the Microwave Down converter option). Extended low frequency of 20 Hz to 1 kHz using system software. The receiver automatically tunes the MDC and displays the tuned frequency. Extended low frequency provides additional bandwidths down to 1 Hz in the sweep mode. An expandable bandwidth set is available below 20 kHz which includes: 250 Hz, 300 Hz, 400 Hz, 640 Hz, 800 Hz, 1.3 kHz, 1.6 kHz, 2.5 kHz, 3 kHz, 4 kHz, 6.4 kHz, 8 kHz, 9 kHz, 13 kHz, 16 kHz. Low Frequency Bandwidths: 1 Hz, 2 Hz, 5 Hz, 10 Hz, 20 Hz. Arrow keys below the display select the tuning digit. The selected digit blinks. Tuning may be done in a manual step by selecting the step key. The step size is determined by the selected digit. The tuning knob also tunes at the selected digit. 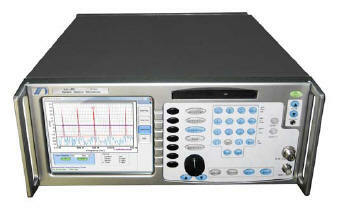 Frequency Resolution of: 0.1 Hz from 100 Hz to 250 kHz, 1 Hz from 250 kHz to 15 MHz, and 100 Hz from 15 MHz to 1 GHz. SYNTHESIZER DESIGN employed to provide programmable frequency control. 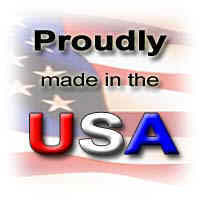 Any frequency may be entered from the keypad with up to seven-digit resolution. AM/FM DETECTOR SWITCH automatically selects audio source; gain controls provided for headphone use. AUXILIARY VIDEO output for z-axis display provides a direct connection for video monitoring. Z-AXIS OUTPUT is provided on the rear panel for "Rastering" of repetitive signals. Automatic remote mode selection by the host computer. Nominal noise figure of 6 dB. Noise floor in a 100 Hz bandwidth of -37 uV. Noise floor in a 10 kHz bandwidth of -17 uV. 80 dB image rejection over the entire frequency range. PRESELECTION FILTERS: Six bandpass filters are individually selected during tuning corresponding with the receiver band and tuned frequency. 750-1000 MHz and 1100 MHz Low Pass. The DSII model R-1580A Microwave Downconverter extends the coverage of the R-1550A, or other DSII wide range receivers, to 22GHz. The Downconverter features a simplified human interface which permits direct tuning to desired frequencies without requiring operator interpretation. When connected to the R-1550A, the receiver tuning display is extended to 22GHz, and tuning, port selection, gain adjustment and attenuation settings are all accomplished with receiver controls and displays, eliminating the need for adjusting the controls of both units. The R-1580A is fully compatible with DSII automated measurement systems, such as the DSI-1550A. When the Downconverter is connected, the extended frequency range is seamlessly integrated with the system sweep and interactive displays. The R-1580 Downconverter utilizes a multiple conversion design with preselection filtering, low phase-noise synthesizers, and high-quality components to provide superior signal capture capability. The built-in microprocessor controls operations and provides display of frequency and status. Communications with external equipment is provided via the IEEE-488 bus. The DSI Model R-1150-10A Portable Antenna Kit contains eight antenna to support electronic field strength measurements from 100MHz to 1GHz and magnetic field strength measurements from 100 Hz to 30 MHz. The antennas are suitable for shielded enclosure or general field use. 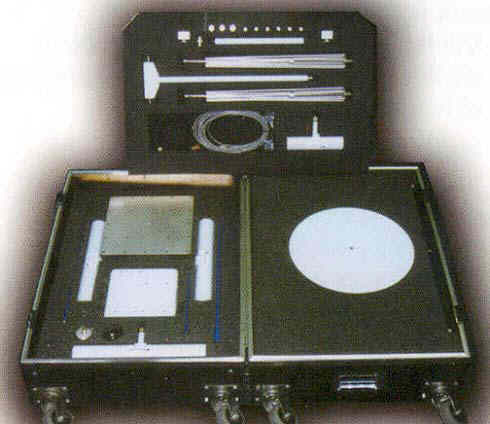 The Kit contained in a luggage type fitted transit case. The Antenna Kit includes passive Biconical and log periodic antennas as well as six active antennas. The active antennas consist of four H-field antennas which connect to a Base Unit containing preamplified filter and control devices. A Control Unit supplies power to the Base Unit and permits selection of the filters. Rechargeable batteries in the Control Unit permit up to 10 hours of operation away from an AC power source. Detailed antenna factors and sensitivity charts are supplied with the Antenna Kit.